As we start out a new month this is a time to get some updates out there. I apologize for the relative lack of updates for the past few weeks, I was traveling in Brazil and while I was able to get a few things posted in that time, it was a vacation so I did not really have the time set aside for blog work. 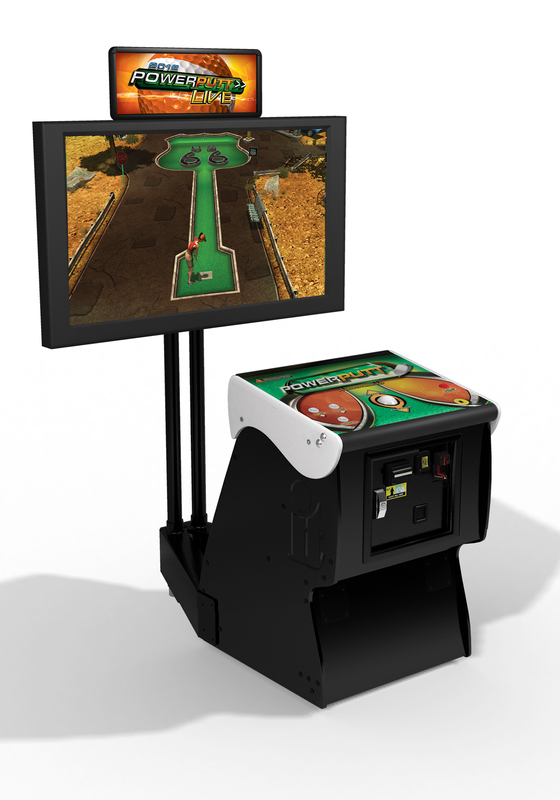 Anyways, one thing I did miss was that Incredible Technologies’ latest title, Golden Tee 2013 is now shipping. Generally they ship out the commercial version first and the home version later (as the home versions do not use their Live network features) but this week is when you should be able to start finding the game out there to play. Also in Incredible Technology news, they have released PowerPutt LIVE as a kit. It was released as a dedicated cabinet earlier this year but as a kit that should make it easier for the game to get out into the market place. I am curious to know how this game in particular does in arcades, while I was on a layover at an airport in the US, I did come across a dedicated version. I am not sure what the price is on these kits but I would venture to guess it’s below $2000 so that it won’t set you back too much to put it into a cabinet that would work for it, whether that is a previous Power Putt pedestal cabinet or an older JAMMA cabinet that could be modified to work fine with it. Next up is an article by GamesRadar about what it is that makes Japanese arcade games so awesome. I can agree with plenty there but I do have to come to the defense of Western arcades on a couple of points. Before I do so however I do give props to the article for not taking what has been the standard route for many writers out there to just claim that Western arcades are all dead and leave it at that. Anyways, not all locations are littered with broken games and there are locations that do keep up-to-date with some of the latest games on the market. Funny enough there is a shot taken at Dave & Busters in the article yet they have been home to more of the latest releases than many other companies, hosting launches of games like Pac-Man Battle Royale Deluxe and Infinity Blade FX. I think that many who do run new arcades would love to always have the latest releases to enjoy but economically that just isn’t really possible in a lot of cases. There are several games I would love to have in my arcade right now that are new but I simply can’t afford it as I pay off others I bought in the past. Heck I would love to get rid of a pair of racing games I have that were kits but a pair of new racers is a huge investment that is difficult to get behind for an operation of my size. It is true that you see a lot of amazing games at Japanese arcades but when it comes to why we don’t see a lot of those crazy games here is the fact that most people just won’t play them enough to warrant the release. I am 100% behind any push for bringing something fresh and unique to market here but if it bombs on test, it will not be released and there isn’t a whole lot that can be done about that. Importing is one way to get around it which a few locations get into, but that is also a very expensive endeavor. In regards to test bombs, there are sadly instances of that happening – Sega Card Gen MLB was a very unique game that involved specially designed baseball cards and a touchscreen. It was tested here first in 2009 but didn’t do well so Sega took it to Japan where it did well enough that they released a sequel version this summer. It’s infuriating that innovative concepts can die like that but that is more of a problem with the gaming public out West who are unwilling to give good games a chance because they are not as dumbed down as a phone game. How do you solve that? It is a question I have pondered often and I’m not really sure what the answer is. We have seen reactions to the mentality with more phone games becoming arcade games, with Temple Run being the latest example of the “If you can’t beat ’em, join ’em” model. There are games which are unapologetic in their challenge, like Dariusburst Another Chronicle which is in the US but extremely rare – I have one and Round 1 USA in California does and that’s it AFAIK. I have enjoyed the game immensely but I have witnessed a lot of players not give it much of a chance after they run directly into enemies instead of shooting at them. Speaking of Round 1, if you want a Japan-like experience in the US, they are a newer location that can offer that and have even gone as far as getting special imports of what are generally Japan-only games but they have the budget to get an English translation as well. Of course, there are problems that operators face no matter what part of the world you are in. With Japan, not all locations can afford massive game setups either like a setup of Gundam Pods. There are going to be cheaper options out there of course but the expensive ones get more attention naturally. I think as long as there are enough cheap options to satisfy smaller operations, that can lead to seeing fewer locations with ‘old broken down games’ as it were.